Drawing is central to the art of Francis Lymburner, a key aspect of his reputation as an artist from the earliest days of his career to the present. It is also inextricably bound with his painting. Drawing was Lymburner's way of expressing his experience of the visible world; he drew quickly, compulsively and with a sense of inquiry, both in sketchbooks and on a larger scale in the studio. Born in Brisbane in 1916, Lymburner spent twelve impoverished years in England seeking to escape what he perceived as the "provincialism" of Australia, but, perhaps ironically, his greatest recognition as an artist came during his time in Sydney between 1939-52. After his return to Sydney from London in 1964, he worked for only two more short years before a debilitating stroke left him unable to paint. This drawing is among a number of industrial landscapes he made in 1961-62 based on subjects drawn in sketchbooks on visits to Wales. 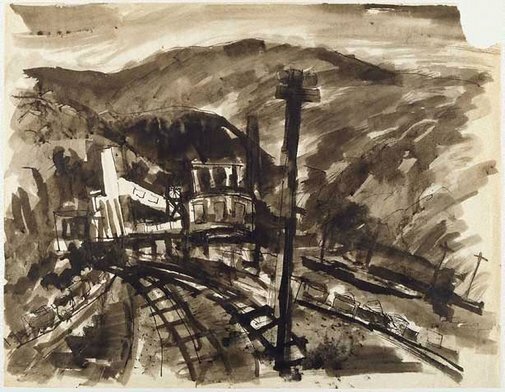 The expressive, painterly application of ink wash over pen and ink lines is typical of many of his late drawings, as was his studied exploration of a subject through a number of works.